Arrrrr! That’s yer five r arr, me mateys, meaning it’s none other that yer favorite pirate turkey, meself Planksy, comin’ t’ Oklahoma, spreadin’ me special thanks and planks this holiday season. Ahoy, buccaneers, imagine me ship, fowl-filled, and sail-trimmed, the Jolly Roger flying high, as it sails the Sooner state, a little quaky these days me might add, but nothin’ me and me crew can’t handle so farrr. Aye, don’t be land lubbers and listen up: This bird arrrrrives to dole me thanks and planks. If yer done good, then yer get yer thanks, a cup or eighteen from Planksy’s special rum barrel and hornpipe dancin’ aboard ship until the wee hours of the wee mornin’ this Thanksgiving. If yer done bad, and if yer a scallywag, bilge rat or lubber, well, my, my, my, yer get yer PLANKS, and a little dip with the toothy fishes swimming circles once yer do yer walkin’. Shiver me gobbler, it’s show time. Arr! Thanks. Ahoy, lads and lasses, me first thanks go out to all yer teachers in the state, a crew of hardy buccaneers, teaching the wee ones spellin’ (me speshality) and readin’ and rithmetickin’, and all while the politicos stick their noses in yer business. Teachers here arrr underpaid and overworked, indeed, but they don’t do it for the treasure, me lads and lasses. It’s a callin’. Arrr. I tip me beak t’ yer, and I ruffle me feathers t’ yer. Come onboard for yer merry times. I’ll scoop yer rum myself. Planks. Arr! Alas, me mateys, my first planks go to schools Superintendent Janet Barresi. She’s got her A through F scheme to rank schools, but it stinks like a dead bilge rat. It’s all about the FFFFFFFF! Is she or is she not a land lubber? 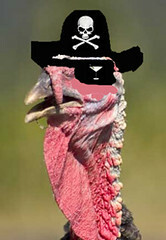 Can a pirate turkey squawk? Squawk! Squawk! Arr! Arr! Barresi wants to fail schools using a system made of smelly ship barnacles, and she’s doing it with ramming speed and no one can do nothin’ about it because Janet and her crew arrr goin’ to have their way. Her point is to spread yer misery in the name of the conservative agenda, but there’s a little election lurkin’, me mateys, just a little tiny wee one. Thanks. Ahoy, thanks galore to all me state workers, goin’ without raises all these years, doin’ their best in these tryin’ times. I unfurl me Jolly Roger in yer honor. Yer arr the glue that holds that state ship together if I do say so meself and I do. Arrr! Watch out what those politicos want to do with yer pensions. Come on board. Let’s get loaded to the gunwales. Dance a pirate’s jig with yer favorite bird. It will be like Fiddler’s Green. Planks. Earthquakes?!!! What kind of scurvy shakin’ is going on, mateys? What’s next? The plague? In this bird’s mind, all yer tremblors, big and small, get me planks, or worse, the keelhaul. Earthquakes are NOT for the birds. How’s me ship to sail smoothly when everything is shakin’ and quakin’. Methinks those frackers got something to do with it, lads and lasses, and then add in yer climate change for yer good measure, and feathers go flying and gobblers go a shivering and there’s no place to come about in this place. Thanks. He’s the bird with the word, with a gobbler adored and acclaimed by all. He’s the feathery swashbuckler with the handsome beak, a famous fowl with the hospitality aboard ship. Me final thanks go to meself, Planksy, for rising above the flock. Here’s wishin’ yer lads and lasses a happy Planksgiving. Enjoy that tofurkey. Arrrrr!